We know you'll love these, as do so many other pople. Cruise companies these days do not send you any documents - you get them online, including your Cruise luggage tag printouts. You need one Cruise Luggage Tag for each bag you take. You have to print and fold these as per the instructions and, just before you board the ship (not before! ), loop them around your luggage handle and staple the ends together. This is so your luggage will find a way to your cabin, all while you're hoping it stays on! ....or you know the ropes already! If you've been on a cruise before, you know the hassle of having to fold and staple your cruise luggage tag printout to your luggage. NOW - We've got the answer! Cruise Bag Tags make it easy as there is no cutting or stapling needed. 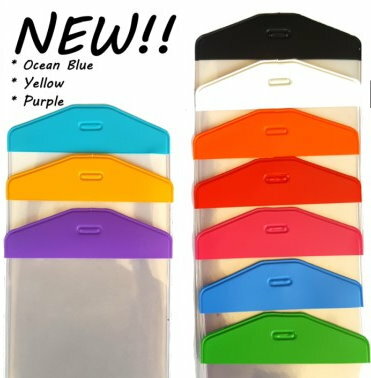 Cruise Bag Tags are much more conveniet and mu /> Cruise Bag Tags are the perfect cruise luggage tag holder. 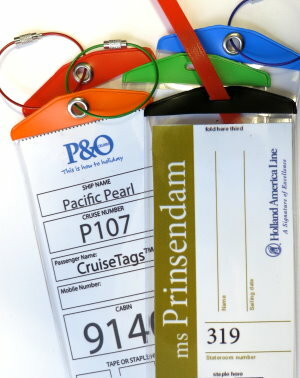 Australian made Cruise Bag Tags are a clear plastic luggage tag designed to hold the folded A4 paper neatly and securely, with the necessary information clearly displayed on both sides. You know that you need to do all you can to make sure your luggage arrives safely in your cabin! And the best part? Cruise Bag Tags are re-usable. You can also customise your Cruise Bag Tag by choosing a different colour combination for each traveller of the group..... or just whatever combinations take your fancy. Not convinced? See what other people think about Cruise Bag Tags!